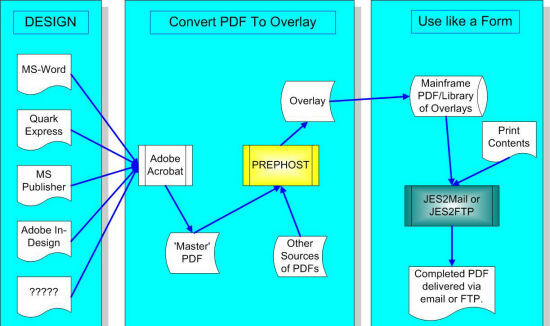 JES2Mail AND JES2FTP can deliver PDF reports/documents that incorporate Form overlays. These can be simple 'stock paper' overlays, or complex government documents. The overlays can be created using Adobe's rich set of PDF creation tools, such as Acrobat and PageMaker. Simple 'stock paper' overlays are dynamically created in response to some configuration statements. Complex PDF overlays are either created or downloaded and then a supplied PREPHOST program will prepare them for uploading to the OS/390 host. Multiple overlays can be included in a final PDF document, with each page of the report using a different overlay. The script language can be used to change the selected overlay on a page-by-page basis.